Looking at my bookshelves I see Who Owns Objects? and Who Owns the Past? ; soon they will be joined by Who Owns Antiquity? I have also remarked on James Cuno's forthcoming book (and also here). 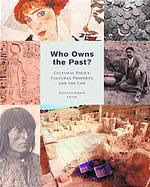 SAFECORNER has now noted the proliferation of books and articles asking the "Who Owns ...?" question ("To own or not to own: Is that the question?"). And it struck me that while archaeologists and politicians have been talking about the stewardship of archaeological sites and cultural property, dealers and museum directors have been addressing a totally different question. Antiquities Waiting to be Returned to Greece?